Not too long ago, we saw the world's first 1080p HD wearable action sports camera in the GoPro HD Helmet Hero. 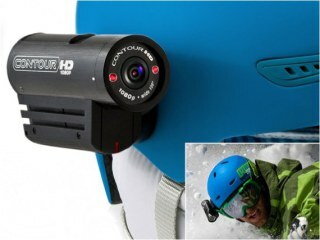 Several months before that, GoPro's close competitor VholdR had introduced an HD sports cam of its own--the Contour HD. However, that camera was only capable of 720p, making it a clearly inferior option, particularly at the same retail price. Well, as one might expect, VholdR has addressed that disparity and unveiled its own 1080p version of the ContourHD. Other than the resolution upgrade, the camera remains largely the same as the ContourHD, maintaining its simple, user-friendly design and operation. Unlike the GoPro, which is a basically like strapping a clunky rectangular point-and-shoot to your head, the ContourHD is sleek and tubular, making it a more aerodynamic option for action sports stars. Like the HD Helmet Hero, the Contour is able to shoot 1080p at 30 frames per second and 720p at 60 fps. It features a 135-degree wide-angle lens. Easy Edit software allows the filmer to easily set-up configurations for the perfect shoot and to share the footage via VholdR's website. Storage is handled through a microSD slot (up to 16 gigs) and audio is recorded with a built-in mic. The rechargeable battery allows for 2 to 3 hours worth of filming. To make the camera work for sports stars of all stripes, VholdR has a number of mounting options that make sliding it onto a helmet, goggles, handlebars, vehicle, etc. a snap. The camera also includes dual-laser alignment to properly line-up the rotating lens no matter where your head happens to be. Can You Bank On Location-Based Social Networks,The Next $hiny Thing?